The smart food market is expected to grow from $325.26 billion in the year 2016, at a CAGR of 8.32% from 2017 to 2022. This growth is attributed to the increasing awareness among consumers about health and balanced diet and also the changing dietary patterns according to modern lifestyle. Moreover, the rising healthcare costs has also driven the growth of this market. Owing to the to the increasing awareness among consumers about health and balanced diet and also the changing dietary patterns due to modern lifestyle, the smart food market is expected to grow at a CAGR of 8.32% through 2016 to 2022. The companies have come up with the smart food segment in their existing product portfolios, marketing them as products which assist in preventing diseases or improve health conditions, thereby further reducing the healthcare costs. 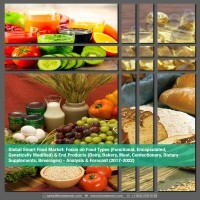 The report is a compilation of the different segments of global smart food market, including market breakdown by the food type, end products, and different geographical areas. Herein the revenue generated from the food type, namely: functional food, encapsulated food, genetically modified food, and others; and end products, namely: bakery products, confectionay, and dairy products is tracked to calculate the overall market size. While highlighting the key driving and restraining forces for this market, the report also provides a detailed summary of the smart food market. It also includes the key participants involved in the industry at the relevant sections. • What is the size, in terms of value ($million) of global smart food market in 2016, and growth rate during the forecast period, 2017-2022? • What are different food types considered as smart food and their recent developments by respective manufacturers? • What is the market size of different end products in this market, in terms of value and their respective growth prospects and key developments? • What is the market size for different food types, based on various end products, and regions? • What is the smart food market size for different regions, in terms of value and their respective growth prospects and key developments? • What are the key trends and opportunities in the market, pertaining to countries included in different geographical regions? • How attractive is the market for different stakeholders present in the industry by analyzing the futuristic scenario of smart foods? • What are the major driving forces that tend to increase the demand for smart foods during the forecast period? • What are the major challenges inhibiting the growth of the global smart food market? • What is the competitive strength of key players in the smart food market by analyzing through market share? • What are the key market players in the market, along with their detailed analysis & profiles (including company snapshots, their financials, key products & services, and SWOT analysis)? The report puts special emphasis on the market share of the services provided in smart food market, owing to the changing paradigms in the industry. In spite of this, due to the numerous instances of failed business models and financial pressure, a majority of potential new entrants resist from adopting smart food services. The reports further includes a thorough analysis of the impact of the five major forces to understand the overall attractiveness of the industry. This segment also focuses on the investments done in the smart food market by the market participants. The most often used strategy for developing a better hold on to the market has been through mergers & accquisition, followed by business expansion. Moreover, the company profile section highlights significant information about the key companies involved along with their financial positions, key strategies & developmental activities of recent years. Further, the report includes an exhaustive analysis of the geographical split into North America, Europe, Asia-Pacific (APAC), and Rest of the World (R.o.W.). Each geography details the individual push and pull forces in addition to the key players from that region. The prominent players operating in the global smart food market are Ingredion, Cargill Inc., Balchem Corporation, Sensient Technologies, Symrise, and Kerry group. Health and wellness have become a matter of priority and concern for the current global population. Moreover, with the growing number of medical cases such as heart diseases, cancer, osteoporosis, diabetes, strokes, and rising healthcare costs, the consumers are becoming increasingly aware about their diet. Identifying this current growing demand of having a healthy lifestyle, companies across the globe are relentlessly putting in efforts to further develop the otherwise stagnating food and fast moving consumer goods (FMCG) industry. The companies have come up with a ‘smart food’ segment in their existing product portfolios, marketing them as products which assist in preventing diseases or improve health conditions, thereby further reducing the healthcare costs. There exists a certain degree of ambiguity related to the meaning and definition of smart foods across the globe. These are the food products which have been developed through invention or new improved processes, and exclude the changes that take place naturally in the food. The smart food market is a combination of different types of foods such as functional foods, encapsulated foods, genetically modified foods, and others (analogue and novel foods). Besides the health benefits that influence a consumer’s purchasing decision, other factors which are driving consumer interests towards smart food products include age, location, education, gender, price, income levels, knowledge and beliefs. The concept of smart food market revolves around the major food types prevailing in the market such as: functional foods, encapsulated foods, genetically modified foods, and others (including analogue food and novel foods). Further, this market provides the consumers with nutritious and healthy alternatives in the form of various end-products. These cover all the key end products ranging from bakery products, confectionary, dairy products, dietary supplements, meat products, beverages and others (including frozen products and fruits & vegetables). Dairy Products are expected to generate the maximum revenue due to the increased consumption of these products across the globe and the benefits arriving out of these products. The trends of the smart food market vary with different geographical regions. The smart food market holds a prominent share in various countries of Asia-Pacific (APAC), North America, Europe and Rest of the World (R.O.W.). Asia-Pacific dominated the market, followed by North America, due to the increasing disposable income among consumers, especially in countries such as India and China. Moreover, the region is expected to grow at the highest CAGR by the forecast period due to reasons such as growing urbanization, growing baby boomer population and changing dietary patterns. The competitive landscape for the smart food market demonstrates an inclination towards companies adopting strategies such as mergers & acquisitions and business expansions. The major established players in the market, are focusing more on mergers & acquisitions to introduce new forms of innovations and different set of food products. Ingredion, Cargill Inc., Balchem Corporation, Sensient Technologies, Symrise, and Kerry Group were the most prominent names that surfaced in 2016 in this regard. These companies underwent a range of mergers & acquisitions and launched various new products. The need for more R&D and appropriate regulatory environments is a prerequisite for sustained growth of this market. Various government and private research institutes, and regulatory bodies and associations are putting in substantial efforts to identifying how smart foods can be beneficial for the human health. Further growth of this market depends on the food industry’s ability to develop new and effective products along with meeting the consumer demands.